Tableau has optimized direct connections for many high-performance databases, cubes, Hadoop, and cloud data sources such as Salesforce.com and Google Analytics. You can work directly with your data to create reports and dashboards. Tableau lets you connect live or bring your data into its fast, in-memory analytical engine. It’s easy to get started: just connect to one or more than 45 databases and formats supported by Tableau, enter your credentials and begin, with a single click to select live connect or in-memory analytics. You can publish web dashboards with live connections on your corporate portal, SharePoint or wiki so your data automatically refreshes. Mix-and-match multiple data sources from different database types in the same web dashboard. 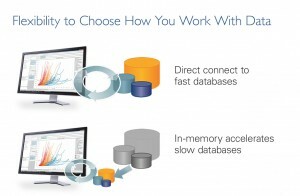 Tableau’s in-memory data engine is not subject to the restrictions of many in-memory solutions which require that all your data fit into your machine’s RAM. Advanced in-memory technology takes advantage of all the memory on your laptop or PC, down to the hard disk, so your analysis can be wicked fast and huge, all at the same time. Tableau’s powerful big data software enables the people who know the data the best to do their own analysis. With drag & drop, point & click ease to build charts, reports and dashboards, Tableau gets people throughout an organization connected directly to their data. There’s no more waiting in an IT queue to answer questions, so now you can begin getting answers from your data. This dashboard uses millions of rows of stock data to show trends in key securities. It was built without any programming by a regular business user. With the right tools, anyone who needs answers from data can get them. Using Tableau for self-reliant visual analytics means you can analyze data with lightning-fast queries on massive amounts of data. By giving you this ability to ask – and answer – questions at the speed-of-thought, Tableau’s big data software puts you at a distinct advantage.